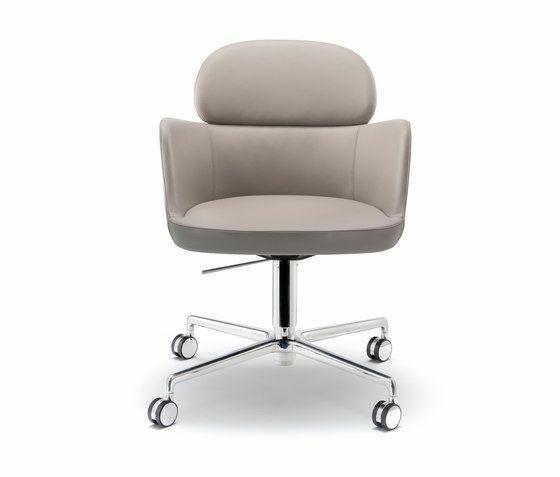 Ester armchair widens its horizons bringing elegance and comfort to offices and hospitality spaces. The soft and sinuous shapes, combined with the four spokes base with castors, ensure maximum comfort and makes Ester Office ideal for executive offices and meeting rooms. The seat is made of polyurethane foam with elastic belts on a steel structure. Upholstered with fabric or leather. Materials and technologies: Seat made of polyurethane foam with elastic belts on a steel frame. Die-casted aluminum central four spokes base with castors. Gas lift device. Finishes: Upholstered with fabric or leather. Polishes or powder coated base. Options: High back rest version available.